A lot of them are already cast but I need to do more work on their character cards & rules before we can pack them. I don't want to be sounding deliberately vague but it is in the "hard to say" territory at the moment. There is a bit to do but we'll be working on better estimates now that we are largely clear of Wave 1 which has had to be our focus for the last few months. I'm more interested in the metal versions of everyone as these will all definitely be seeing the table as gaming pieces for me! Loving the fact that the Pledge Manager is going to reopen (Yay!) and that anything we add in will ship 'free' as well! Quick question - as this seem like a good time to ask 'again' - any chance that the rest of the Guild will be available in metal at that time too - Mokey, Pigsty, etc.? We hope they will be. It rather depends on how Nic @ Eureka goes with mould making. It's high time for an update on our progress producing your Wave 2 miniatures! First up, Peter and I want to sincerely apologise for the fact that it is taking longer than expected to fulfil Wave 2. We know you have been waiting quite a while, and we really appreciate the fact that you have all been very kind and patient with us so far. Thank you very much for being so cool about it. We truly are doing our very best and working as hard and fast as we can to get Wave 2 produced and shipped - nobody is more keen than we are to get Wave 2 out there. There's no special reason for the delay other than the fact we underestimated the time it takes to physically mould, cast and pack the thousands of miniatures needed! The good news is that we are making steady progress: the metal casters at Eureka Miniatures have been churning through the moulds and casting like crazy, and there is a massive heap of thousands of miniatures ready to pack into Faction Boxes! The resin casters at Eureka and Magos Miniatures are also working round the clock and making great progress on the resin production runs. It is still hard to give exact ETA dates, but I am hoping all the casting will be complete next month. At that time we are planning to re-open the Pledge Manager for a month or so while I pack up all the miniatures into boxes and blisters, and then prepare all of your orders for shipping. You will be very welcome to add on any extras to your order at that time - we'll have all Wave 2 Kickstarter stuff available plus of course all the miniatures from Wave 1! It will be a good chance to grab a final bargain before the Twisted KS is finally done and dusted. Ok, now time for the fun stuff: some photos! You might have seen this teaser photo on Facebook showing Monkey's Troupe of Travellers: Tricia Harker, Monkey, Pigsty and Tzandi. Here's another teaser 'desk pic' of the new urkin coming to reinforce the Dickensians: Ratcatcha, Dawg & Flea, Rozzer, Shrike and Jack'O. 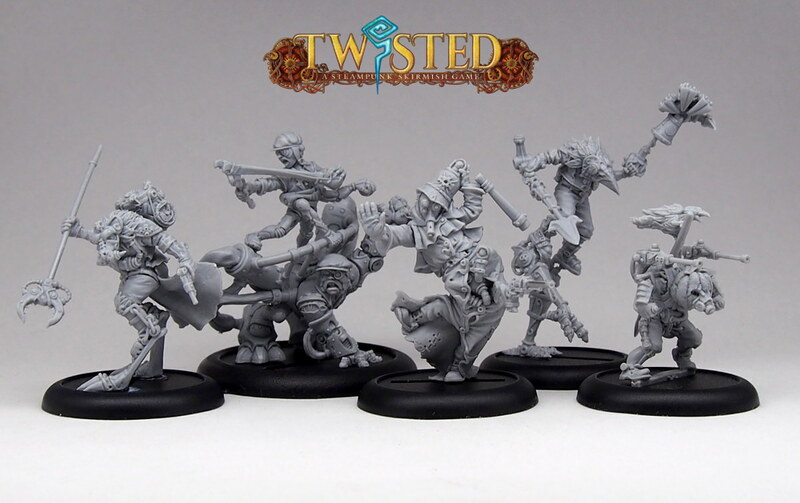 What a group of miscreants eager to cause all sorts of mischief on the tabletop! Thanks everyone, we are getting there. Thank you once again for being so patient with us, you've been really fantastic to us so far and we both really appreciate it. I cannot wait to get Wave 2 fulfilled, I'm sure you will be thrilled with the result. I am also really looking forward to moving on with Twisted post-KS with some new Characters we already have in the works! ...but it's been awfully quiet in and around here lately! Any chance of some more snipets of info for the Devoted who stop by here every now and then? Any word on when the Pledge Manager will re-open? 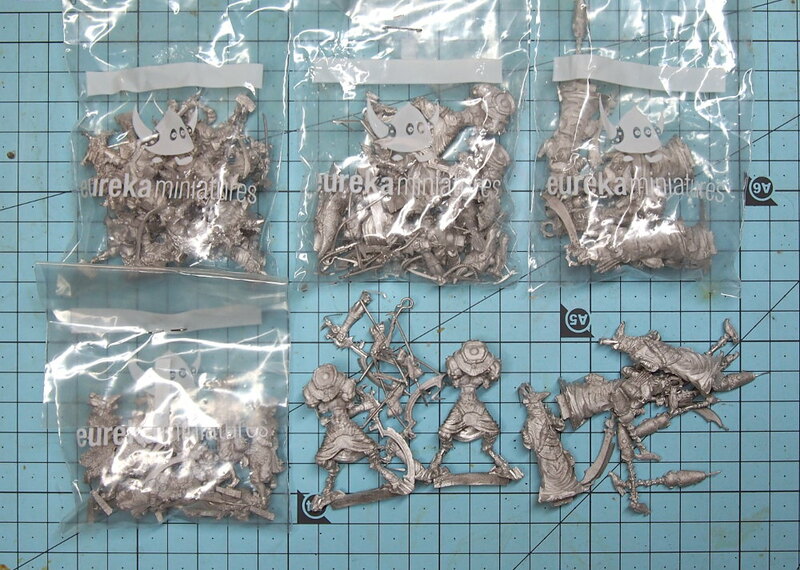 And, just as importantly, will the Monkey King and Company be available in metal then as well? And perhaps even more importantly than that, any word on if that much anticipated Avatar of Horus (and the even MORE anticipated Avatar of Anubis!) has made it into the idea and/or playtesting phase yet?! ?